Tired of getting lost in the original Doom while hunting for ammo packs and teleporters? Well there’s now a mod that takes everything in the game and unravels it along a single, unwavering path. It’s called Linear Doom. 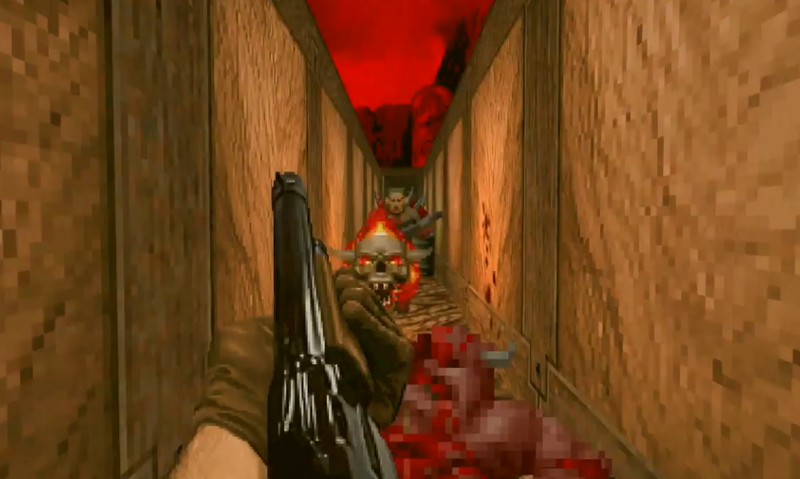 Created by modder DeXiaZ and uploaded to ModDB, Linear Doom takes all of the game’s clever level design and reduces it, from beginning to end, into a series of corridors. It’s still possible to move slightly to the left or right, but for the most part the game only operates along a single axis. Everything from demons to secret switches have been condensed so they all appear within a single hallway. All of the walls from the original 3D spaces are still present; they’ve just been flattened into a new kind of especially hellish dimension. On the one hand it’s impossible to get lost; on the other hand it’s impossible to avoid enemies. Linear Doom is best played holding down the forward arrow and CTRL button like your life depends on it, because, well, it does. It’s easy to get up and running. All you need is a copy of Doom, the GZDoom software, and a copy of Linear Doom downloaded from ModDB. If you’ve ever had dreams of speedrunning Doom, now’s your chance. It's a ridiculous idea and I love it. So it's the "daredevil" mod.